Our Facebook feeds are full of videos from family, friends and our favorite creators, but watching videos while browsing your feed hasn't always been intuitive. Improvements to the Facebook app make watching videos easier with a bevvy of brand new video features. Vertical videos will now fill the whole screen. You can now more easily navigate a video by sliding the timer back and forth. A thumbnail image shows where you are, making it easy to jump to the part you want to watch. If you want to watch a video while continuing to scroll through your feed, you can minimize the video into a small picture-in-picture window that hovers over your news feed. The PIP window will keep playing as you scroll. Android users get that same picture-in-picture window outside of the Facebook app as well, letting you watch Facebook videos no matter what you're doing. The new features should make watching videos on the go easier than ever, but not everyone enjoys autoplaying video. Fortunately, you can disable this feature. In Android, open Settings > App Settings, and disable the "Videos In News Feed Start With Sound" option. In iOS, go to Settings > Account Settings > Sound, and disable the "Videos In News Feed Start With Sound" option. You can still enjoy the other features, but you won't have to deal with loud videos playing as you scroll past. 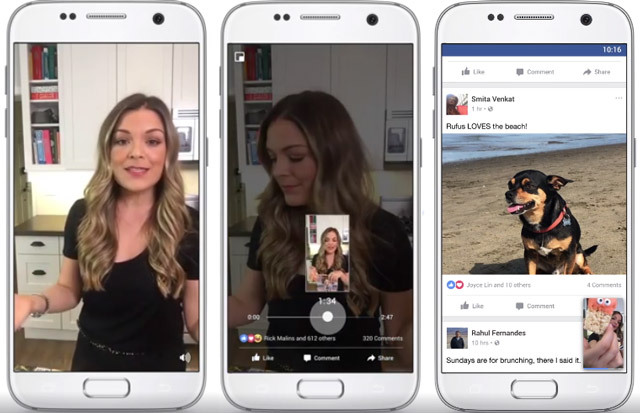 Facebook video is now coming to your television with the Facebook Video app for Apple TV, Amazon Fire TV and Samsung Smart TV. Features are similar to what you've come to expect from other video apps. You can browse videos from friends and pages you follow, watch live video and view recommended videos. Expect the updated apps as well as the new Facebook Video app to be available soon. If you're excited about the Facebook Video app but don't have a compatible device, Facebook says you'll see support for other streaming media players and smart TVs in the future. Nice to know the update . Actually showing video is going to be more popular for any brand .So we should be concern also in social media .